Description - The needle is the part of the plant that is steam distilled. 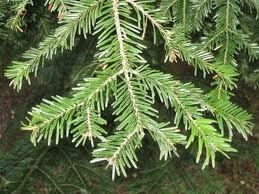 The Fir needle essential oil comes from the Pinus type tree. This popular oil is used to bring out the masculine qualities in men's fragrances, shaving creams, and soaps. Effects On The Mind - This is a refreshing and stimulating oil increasing energy while producing a sense of well being. Effects On The Body - It can be used in the treatment of arthritis, anxiety and tension, bronchitis, colds, coughs, flu, muscle aches, rheumatism, and sinusitis. Fir can act as a tonic to the central nervous system, and has reviving, refreshing, and warming properties. Note - Middle. Fir has a very fresh, woody, earthy and sweet aroma much like the outdoors. Blends Well With - Cedarwood, Cypress, Eucalyptus, Lavender, Marjoram, Peppermint, Thyme, and Tea Tree. Cautions - Do not apply directly to skin without diluting in a carrier first. Although, fir is considered to be non-toxic, non-irritant, and non-sensitizing, please avoid using while in the sun. It can cause skin irritation if used inappropriately.